Happy Birthday to David/Daddy! Carrot cake and sugar cookies and he is experiencing a little bit of heaven. We drove to downtown Denver to join a surprise party at work (with more DELICIOUS carrot cake AND sugar cookies). He was surprised. We played hard on a warm afternoon and chilly evening in the fallen leaves of our cottonwood trees. Halloween started with meeting friends at the library for storytime and "trick or treating." Hanna was very reserved with the "scary" songs and games. That is Hanna.=) When we left, all she said was, "The ladies looked like bats" (notice the "bat" with horns=)). 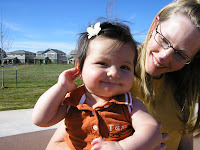 That morning, she was simply a ballerina, and Aurelia was a Longhorns' fan. Then we and friends with packed lunches and played at the park for part of the warm afternoon. In the evening we went to a harvest festival at the church for games, bouncing tents, candy, food. I am glad I took some pictures before we left. Aurelia was not happy in Tigger for long. Hanna was a flower fairy. Hanna's first carriage ride sqeezed between (for her safety she was moved) two strangers. Oh, so serious. I think she felt special in her costume. However, she was very reserved again about playing games in the mist of all the loud activity. I thought this year she would warm up much faster. Oh, well. Maybe next year. Hope you're enjoying fall!